Marvel at the wonders of the skies above with the saxon 10" DeepSky CT Dobsonian Telescope （254/1200）. This collapsible telescope comes with an aperture of 254mm and a focal length of 1200mm, promising bright views of the Moon, planets and deep sky gems such as star clusters, nebulae and galaxies. Portability of this telescope is made easy with the truss-design, allowing for easy assembly and disassembly during transport. For a scope that'll last the test of time, look no further than the saxon 10" DeepSky CT Dobsonian Telescope. Immerse yourself with views of deep sky objects at a reasonable cost with the saxon 10" DeepSky Dobsonian Telescope （245/1200）. This telescope is built with a primary mirror made from Pyrex glass and comes with a light-devouring aperture of 254mm and a focal length of 1200mm. Get bright, clear views of the Moon, planets, star clusters, double stars and galaxies with this scope. This 10" telescope comes with a host of parts and accessories -- Plossl eyepieces to give you a wider field of view, a finderscope to help you find objects and a Crayford focuser to provide smooth, precise adjustments. The saxon 10" DeepSky Dobsonian Telescope is a telescope for serious beginners that is built to last. The saxon 12" DeepSky CT Dobsonian Telescope （305/1500） is the scope that combines performance with portability. This telescope comes with a massive light-hungry aperture of 305mm and a focal length of 1500mm. Immerse yourself with spectacular views of constellations, planets, double stars and galaxies with this advanced telescope. For a telescope that's built with outstanding quality and stability, it has to be the saxon 12" DeepSky CT Dobsonian Telescope. For the serious astronomer who won't compromise on quality and useability, the saxon 12" DeepSky Dobsonian Telescope （305/1500） is perfect for you. This telescope is built with a primary mirror made from Pyrex glass and comes with a staggering aperture of 305mm and a focal length of 1500mm, making deep sky observation possible. Bright, clear views of Saturn, nebulae and galaxies are easily visible in your eyepiece, thanks to the scope's parabolic mirror, special roller-bearings, Crayford focuser and included Plossl eyepieces. 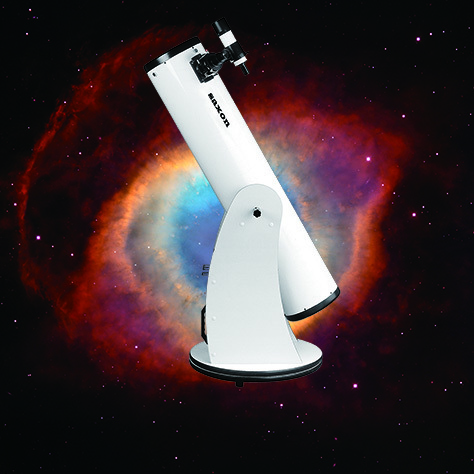 Observe the wonders of the night sky with the saxon 12" DeepSky Dobsonian Telescope. The saxon 6" DeepSky Dobsonian (153/1200) Telescope is your pathway to the night skies! This telescope comes with a light-grabbing aperture of 153mm and a focal length of 1200mm - perfect for viewing the Moon upclose as well as bright deep sky objects. This scope comes with quality parts and accessories - the rack and pinion focuser allows precise focusing of your object while the included eyepieces and finderscope means you'll be ready for your observing session once your scope is assembled. The easy to use and affordable saxon 6" DeepSky Dobsonian Telescope is perfect for the amateur astronomer and serious beginners. You can't get enough of big scopes due to its light-gathering capabilities but what about storage? Well, the saxon 8" DeepSky CT Dobsonian Telescope （203/1200） may just be the answer! This Dobsonian telescope will bring you to the galaxies and back, thanks to its 203mm parabolic mirror and focal length of 1200mm. This scope's collapsible truss tube design makes it easy to assemble and disassemble to transport in between uses. For a great night out with the stars, you'll appreciate the company of the saxon 8" DeepSky CT Dobsonian Telescope. If your requirements for stargazing are reliability and performance, the saxon 8" DeepSky Dobsonian Telescope （203/1200） will not disappoint. This easy-to-use telescope comes with an amazing aperture of 203mm and a focal length of 1200mm in an 8" optical tube. Assembly of this scope is quick and painless with no additional tools required. See the planets, star clusters, nebulae and galaxies with this quality, affordable scope. Take to the night skies with your saxon 8" DeepSky Dobsonian Telescope. The saxon 76/300 Mini Dobsonian Telescope is the perfect telescope for budding astronomers. This telescope comes with a focal length of 300mm and an aperture of 76mm which provides bright, sharp views of sky objects. This scope sits on a stable tabletop base and weighs just under 2 kg, making it easy to carry indoors and outdoors between use. You get two 1.25" eyepieces with your pre-assembled telescope - all you need to do is attach your eyepiece to start observing! The saxon Mini Dobsonian Telescope makes a great gift for astronomers of all ages and doubles as a great display piece. For those wanting a compact and portable telescope, look no further than the saxon 76/300 Mini Dobsonian Telescope with Accessory Pack. This tabletop telescope is small in size but packs a punch with its 76mm aperture and focal length of 300mm. Don't be surprised when views of the Moon, planets and bright nebulae come through this scope! The upgraded accessory pack means you get four eyepieces, a moon filter, a finderscope and a carry bag to put the whole lot in. The pre-assembled saxon Mini Dobsonian Telescope with Accessory Pack means you can simply remove the scope from the box as soon as you get it, attach an eyepiece and start viewing immediately!